I moved from Ryderwood, Washington in November 2016 and relocated my shop to Chehalis, Washington. You can see photos of the old Ryderwood shop here. Our new house came with a cavernous 30x40 foot metal building that I subdivided into an L-shaped heated workshop and an L-shaped unheated parking space for my pickup and mower. Here's how it looked when we started. The cabinets were left by the previous owner and I was glad to have them. You'll see them again in the finished shots of the machine room below. I designed the space and hired MDK Construction to build it. I built my last shop and could have built this one, but I'm slow and I needed this one finished so I could move my machines in and sell our Ryderwood house. MDK didn't disappoint! Here's a shot from their first few hours of work. The shop is in the back in order to isolate it from the roll-up doors and to leave parking for my truck and mower. I limited the ceiling height in the shop to eight feet to make it easier to heat. Chehalis is only about 500 feet above sea level but far enough north to get cold. That low ceiling also gave me a usable attic for storage. Here's the stairs up to the attic, and the door between the garage space and the shop. 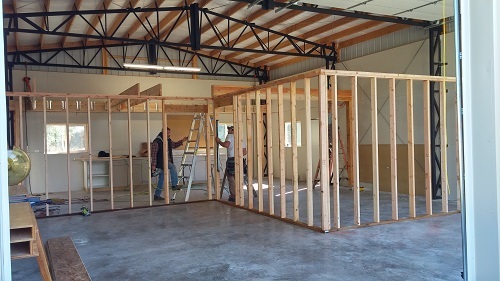 I had the builder sheathe the walls with 1/2" plywood inside and out. It costs a little more and isn't as fire retardant as drywall, but it holds screws much better for hanging stuff. Here's the attic, not quite finished, but you get the idea. 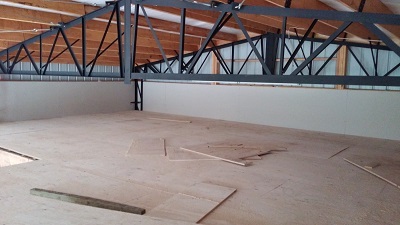 The trusses are in the way and you have to duck around up there but the space is still usable for storage. I had the electrician add two lighting circuits and three plug circuits with plenty of 4 plex outlets in the walls and ceiling. You can see finished shots of this wall below. Fast forward to the completed space. I painted the interior myself, and that's what I was doing here. White to reflect light better. And I rolled the walls before putting trim on the windows and doors. The window in the middle is a new one. The steel cables in front of it are bracing for the metal building. It's not a pole-barn so it needs bracing to keep it upright. While they were at it, MDK added a sidewalk over to the house and a new door into the back of the garage. Much nicer than gravel or stepping stones! And here's the finished machine room with the dust collection installed. You can see those same cabinets that were there before construction started. And a couple shots of the assembly area. I affectionately call it my Gepetto Corner. The high shelf is tonewood storage. The wall with the clock is the same wall with the electrical outlets shown above. Here's a shot of my crowded bench in action. Well, that's the quick tour. If you want a better look, come visit! 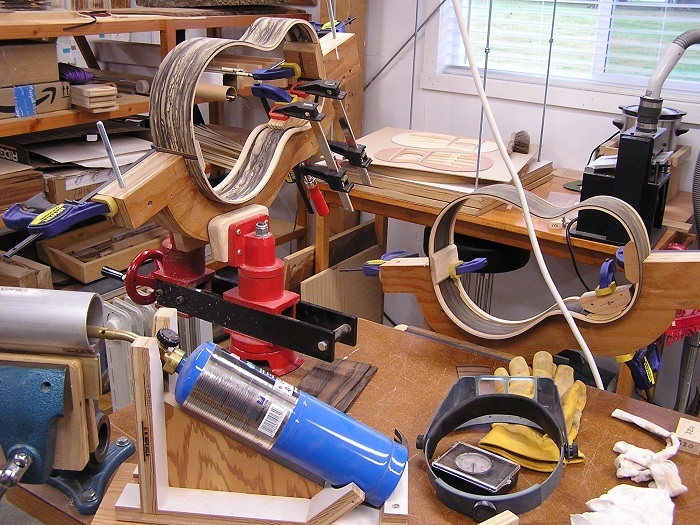 Please see my Contact Page for information on visiting my workshop, and visit my Instruction page for information on lutherie instruction in my workshop.